From left to right: ARTBA Chairman David Zachry, HC Bridge Company President & CEO John Hillman, Federal Highway Administrator Greg Nadeau, HNTB Senior Vice President Ted Zoli, HNTB Holdings President & CEO Paul Yarossi and 3M Traffic Safety & Security Division Vice President & General Manager John Riccardi. This year’s Dr. J. Don Brock TransOvation™ workshop not only focused on innovative thinking and trends to watch for, it gave attendees of the 5th annual event the opportunity to work with leaders in the industry to break down real barriers to innovation in transportation design and construction. 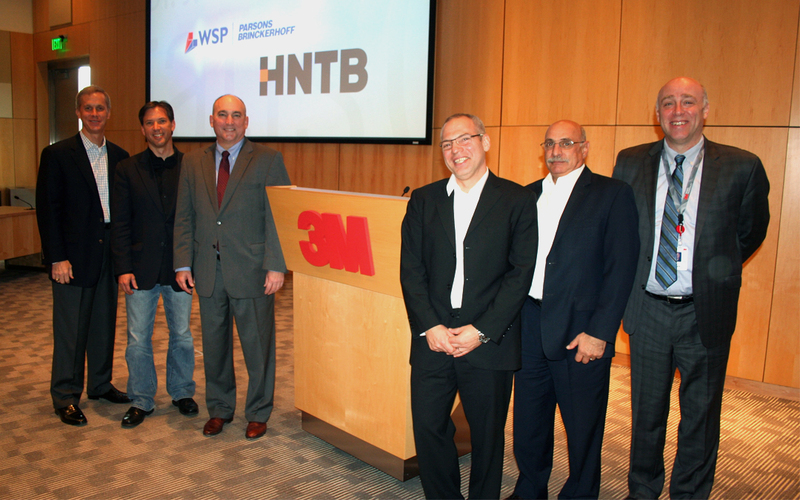 The event was held Nov. 16-18 at 3M’s Innovation Center in Saint Paul, Minnesota. ARTBA Chairman David Zachry kicked things off with background information about the origin and goals of TransOvation™ and offered a status report on the reauthorization of the federal highway and transit bill. Long-time TransOvation™ hosts and organizers, Ted Zoli, senior vice president with HNTB Corporation, and John Hillman, owner, H.C. Bridge Company, illustrated examples of innovative thinking. Zoli told attendees that “mindlessness is the first barrier to innovation.” Hillman provided a detailed case study of the obstacles and challenges an entrepreneur faces when trying to introduce a new product into the transportation construction industry. ARTBA Vice Chairman at Large John Riccardi, vice president and general manager of 3M’s Traffic Safety and Security Division, and several of his colleagues, shared key insights into potential megatrends to watch for as well an in-depth look into the innovative culture at the firm that has led to tremendous growth across many different industries. Attendees heard from a panel of public agency officials from Maine, California, Virginia, and private sector leaders who explained their perspectives on the challenges of getting new products into the transportation construction market, such as a lack of innovative organizational culture to regulatory hurdles from bureaucracy. During the workshop portion of the event, and after hearing from experts, attendees broke into three groups, were asked to identify barriers to innovation, and to prepare a presentation on how to best overcome them. They considered the relevance of the federal “Proprietary Products” rule (Title 23 C.F.R. 635.411) and how that may hinder innovation. Much of the consensus from the group revealed a common belief that there are many tools to increase the ease for products to enter the transportation construction market, but that these tools are being underutilized. The group recognized that lack of innovative culture within organizations and agencies is a major problem and asserted their view that change needs to begin there. The presentations of the three groups will be posted on www.transovation.org soon. TransOvation™ plays off the off the meanings of three words—“transportation,” “innovation” and “ovation.” It is named after the legendary founder of Astec Industries, which is headquartered in Chattanooga, Tennessee.